It’s actually somewhat hard to believe that Jean-Claude Van Damme hasn’t already made a comedy at this point in his career – and no, I don’t count STREET FIGHTER, although it is very much amusing to watch. WELCOME TO THE JUNGLE almost looks and feels like an early 1990s film, but there’s definitely some potential for a few chuckles, judging by the trailer at least. Directed by Rob Meltzer, the comedy also stars Megan Boone, Kristen Schaal, Adam Brody, Dennis Haysbert, Rob Huebel, Bianca Bree, Robert Peters, Eric Edelstein, and Aaron Takahashi… plus I think I saw Nick Swardson in there, though he’s not listed on IMDB as being in it. Check out the poster above and the trailer below, and tell us your thoughts in the comments. Will JCVD be an expert at the SIDE-splits as well?!? Yeah I know, that was terrible, but I couldn’t resist. Useless Bigfanboy.com Trivia – WELCOME TO THE JUNGLE was also at one point the title of the Dwayne “The Rock” Johnson action film THE RUNDOWN (2003). 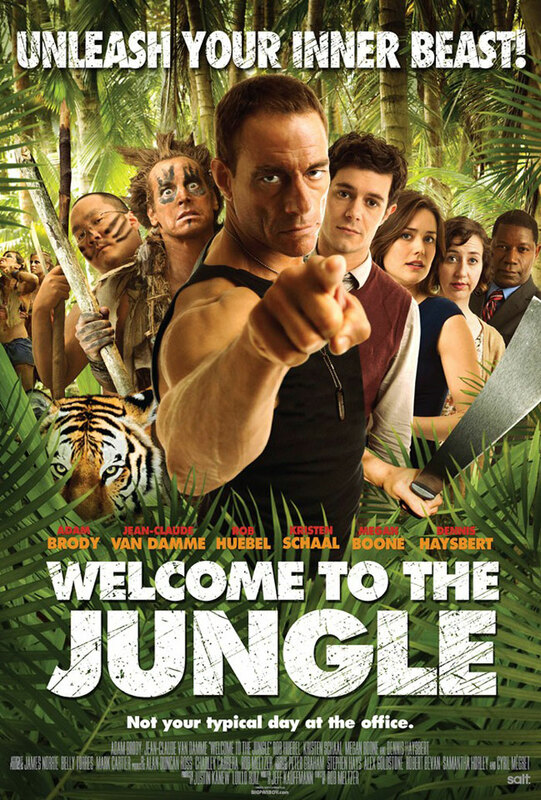 Legendary action star Jean-Claude Van Damme takes on his first comedic role and joins Adam Brody, Rob Huebel, Kristen Schaal, Megan Boone, and Dennis Haysbert in “Welcome to the Jungle”. This laugh-out-loud comedy follows a group of unsuspecting office workers who find themselves stranded on a desert island when a corporate retreat led by unhinged former Marine Storm Rothchild (VAN DAMME) goes horribly wrong. Now Chris (BRODY) and his co-workers must battle nature — and each other — to survive!